Up-Armored Knives. We’re going to have to have one. If you’re not actually in the field on a mission where someone is actually going to be shooting at you, you’re going to want to put a bright yellow or orange para-cord lanyard on one of this guy’s knives, because otherwise it’s gone if you set it down somewhere (or drop it – which why they put the ‘cord’ in ‘dummy-cord’, dummy). Will, the man behind up-armored is a detective and an SRT member for a Sheriff’s Department in New York and he is the Charlie Daniels of the airbrush (or the Rembrandt, you be the judge). Some of these knives he makes himself (check out the Menace) others are sent in for a custom “paint job”. Everything he does is in duracote, and everything is original. No two patterns are ever going to be the same. 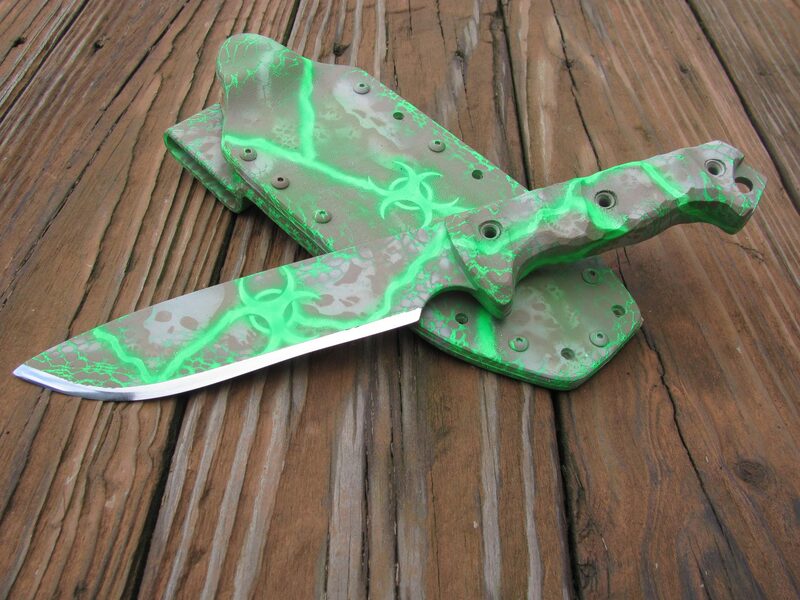 The Menace zombie-killer is our favorite, of course, but he has digital patterns that are suitable for woodland, desert, urban and other environments. Look at the website, and Like them on Facebook to be entered into the next prize drawing. Let them know Tactical Fanboy sent you. 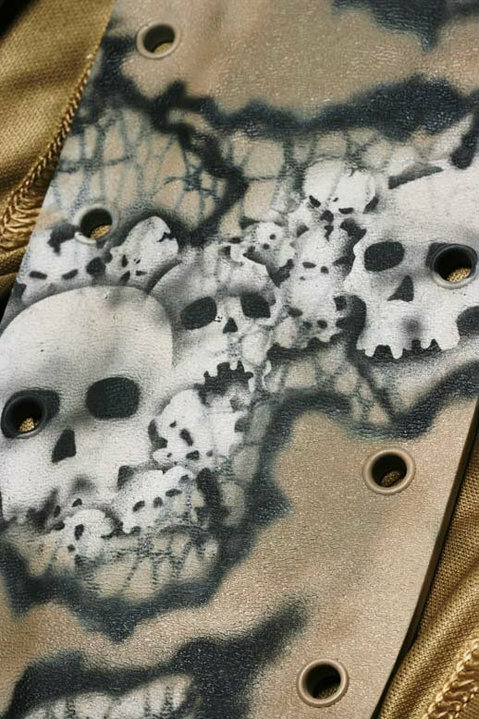 Desert Night Ops: Skull eyes over the eyelets is sublime. 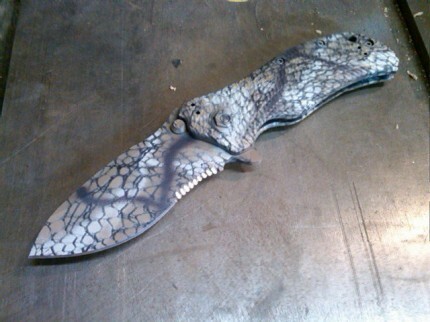 ZT "Desert Floor" Pattern: epic custom airbrush work. 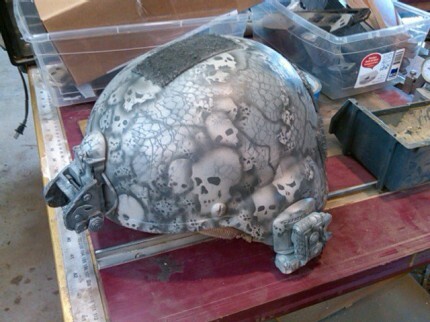 ACU Pattern skull helmet. Damn. If the knives are awesome...what is this? Don’t forget…like them on Facebook, and mention you read about them here. This entry was posted on Sunday, October 16th, 2011 at 18:00	and is filed under Camo, Knives, Zombies. You can follow any responses to this entry through the RSS 2.0 feed. Both comments and pings are currently closed. Your article is very insightful. Thank you! 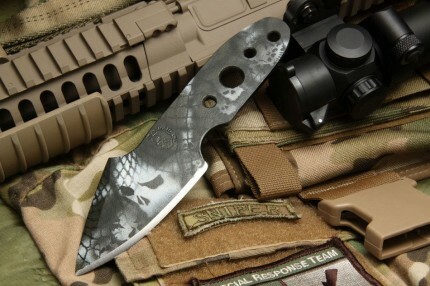 This is a quality knife worthy of its name and created for the rigors of wilderness survival! Great product! I will be buying two. can you do gun stocks? can u gun stock n pistolgrips?